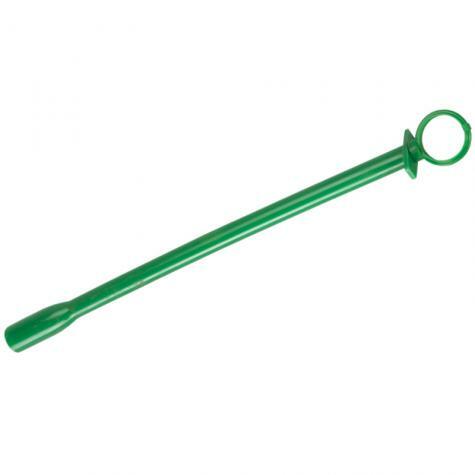 Enables safe and effective insertion of deworming boluses in sheep and goats. Those new to the sheep and goat business may not know that one cannot stick a hand into a mouth without risking serious lacerations. And if one pushes a bolus into the edge of a adult sheep or goat mouth with your finger tips, the bolus (damaged) will quickly appear on the ground. A bolus gun is needed to protect your fingers and ensure that the bolus is placed deep enough to ensure it is swallowed. Place pill in pill holder. Gently slide gun along inside of mouth between cheek and teeth, missing the back molars. Push plunger to push the pill to the back of the mouth and down the throat. Be careful not to push the gun too far down the throat. Wash after using.